ANOTHER day, another new hot Vauxhall model. The firm’s VXR-badged quest to inject more performance, more character and more desirability into the range means the recently-facelifted Vectra has now also undergone the extensive go-faster treatment. The result is the piping hot Vectra VXR which arrives in showrooms at the end of this month wearing a £23,995 price tag, with the estate adding a further £1,000 to the bill. Paul Adler, Vauxhall’s fleet brand manager, reckons he’ll sell around 1,000 Vectra VXRs in 2006, with the fleet market accounting for half of sales. The bulk of those will buy the hatch, with only a quarter opting for the estate. He said: ‘Getting the right car on user-chooser choice lists is absolutely crucial for us, which is why we’ve added the Vectra VXR. Adler also hopes that there will be a number of upper-echelon buyers who will opt for the Vectra flagship rather than taking an entry-level BMW 3-series, Mercedes-Benz C-class or Audi A4. 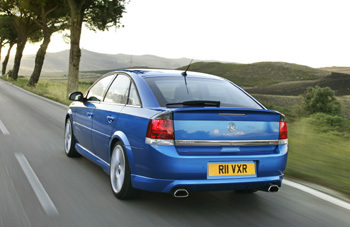 Take a look at the hotshoe Vectra and his confidence is more easily understood. Visually, this VXR is a right bruiser with a kerb-kissing bodykit, deep front chin, split rear exhaust pipes, 18-inch wheels and colour-coded front grille. And that sharp and more aggressive new nose further improves the Vectra’s performance visage. The VXR is powered by Vauxhall parent company General Motors’ all-new 2.8-litre turbo V6, which makes is debut here and will also be used by Saab in the 9-3 Sportwagon Aero. It drives the front wheels through a bespoke six-speed manual gearbox. In VXR tune, the 2,792cc all-alloy engine, complete with advanced variable valve timing, produces some impressive performance figures – 251bhp at 5,500rpm and a hefty 262lb-ft of torque at 1,800rpm. A 0-62mph time of 6.5 seconds and a 161mph top speed makes the VXR not only the fastest Vectra yet, but also the fastest Vauxhall. The estate is similarly quick, posting figures of 6.7 and 158mph. You’ll need deep pockets to run the VXR though – it has a high CO2 rating of 247g/km (250g/km for the estate) and a combined fuel economy figure of 27.4mpg (estate: 27.2mpg). To match the engine’s appetite for speed, Vauxhall has fitted 345mm ventilated front brake discs and 292mm solid rears, backed up by anti-lock brakes, brake assist and brakeforce distribution. The chassis is upgraded to handle the power hike. The VXR comes with IDS2-Plus – Vauxhall’s advanced Interactive Driving System – as standard. This electronically links the car’s key safety functions – the stability control system (ESP), traction control, Understeer Control Logic (UCL), the four-channel anti-lock system, Brake Assist and Continuous Damping Control (CDC) – to work as one integrated dynamic package. And it couldn’t be simpler to operate – simply toggle the VXR’s Sport button on the centre console and the whole lot kicks in as well as firming up the dampers and recalibrating the steering for more feel. The VXR cabin treatment is more restrained – there’s a pair of fabulously supportive winged Recaro seats, red accents on the instrumentation, a chunky leather-bound steering wheel and gearlever and some rather cheap-looking faux carbon-fibre trim. Spec levels are high. VXR drivers will enjoy air-conditioning, Xenon headlamps, cruise control, DAB digital radio and CD stereo, six airbags and a multi-function steering wheel. Vauxhall argues that the VXR has no real rivals, claiming there’s nothing out there that matches its performance, looks and value. Ford would argue its Mondeo ST220 comes close, while Mazda’s up-coming MPS6 and the current Subaru Impreza STI will all give the user-chooser something to think about. 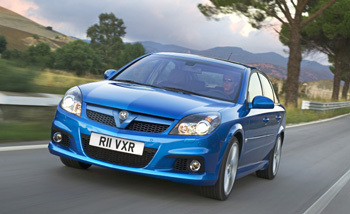 The VXR is – surprise, surprise – a very fast car. With that turbo kicking in early, the Vectra is bruisingly rapid. The engine’s deep torque reservoir also makes it wonderfully flexible – it will pull cleanly from jogging pace in top gear without any fuss. And it emits a soundtrack that fits the VXR’s image to a tee – a deep-throated, low-speed burble that rises to a crisp top-end wail. On smooth, fast and flowing roads it makes a fine job of providing rapid, spacious and very refined family transport. The brakes also do a fine job of tempering the engine’s enthusiasm, carving off great chunks of speed with ease. Sadly there’s not as much glowing praise for the rest of the driving experience. The steering feels overly light and lacking in real feel and the chassis never feels truly tied down. The combination of a mightily sensitive throttle, sharp clutch and heavy gearshift make driving the VXR smoothly something of a black art. The ride could politely be described as firm but in reality it will be too jarring over broken Tarmac for most drivers. Torque steer is also a problem, where putting down the power too soon results in unruly tyre scrabble. The VXR’s nose also constantly snuffles out cambers over anything but smooth roads. Activating the Sport setting seems to do little more than stiffen the ride further so it’s jarringly uncomfortable and sharpen the already too-sharp throttle. Despite its advanced electronically controlled suspension and chassis set up, spirited driving all too quickly shows a distinct lack of poise. The Vectra VXR is not the complete package we’d hoped for. It looks the part, is very fast in a straight line and there’s no arguing with its generous bang-per-buck quotient. But dynamically it falls surprisingly short. Drive it as a fast and refined motorway cruiser and it excels. But those looking for fun on their favourite roads will be disappointed.